If rain shakes up the order in qualifying, intermittent rain creates complete chaos. So it proved for the German GP qualifying sessions, catching several drivers out and promoting others beyond their usual expectations. Rubens Barrichello seemed to know exactly the right moments to change tires and his Q2 time, over a second quicker than anyone else's, reflected this. As the end of Q3 neared, the rain had fizzled out and everyone was having a go on the drying track. 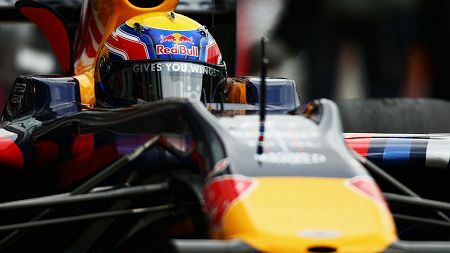 Mark Webber's quickest looked to be a bit early to hold on to pole but it proved to be sufficient in the end. For a brief moment, Vettel made it a Red Bull one-two, but first Button and then the canny Barrichello managed to squeeze in between them. This was Mark's first ever pole position and must surely raise hopes of a maiden GP win tomorrow. The speed of the Red Bulls was to be expected in view of the cool conditions and, on past form, the damp track should have given them even more of an edge on the competition. It was a surprise to see the Brawns doing so well, therefore, especially as practice had not gone well for them. It seems that the Red Bull and Brawn advantages and disadvantages cancel themselves out on this track and we should see a tremendous battle at the front in the race. The surprises mount as we proceed down the grid, however, McLaren having confirmed that the team's performance in practice was no flash in the pan. Lewis Hamilton was in the thick of the fight for quickest time throughout all the qualifying sessions and he is well worth his ultimate fifth spot on the grid. Kovalainen came good at last, putting his MP4-24 (minus some of the tweaks on Lewis' car) into sixth. Hats off to Adrian Sutil, next up in his Force India, its first ever appearance in Q3 after a fine showing in practice. Although Sutil's wet weather skills may have helped in achieving seventh grid spot, the car is obviously much improved and the team must surely be due their first points very soon. The Ferraris made it to Q3 but could manage only eighth and ninth, the car looking very difficult in the wet and both drivers having their fair share of off-track excursions. And Piquet gave us another first by out-qualifying his team mate, Alonso, although Fernando's spin on his final lap in Q2 was probably the deciding factor. He lurks in 12th spot, two places down from Nelsinho. I think Nick Heidfeld has taken out a season ticket on eleventh grid spot, so often has he just missed the cut into Q3 this year. He claimed it again this time out but looked a good deal happier with the BMW than his team mate did; Kubica failed to get past Q1 and never seemed likely to. The team are keeping pace with the development of other cars but really need to find some McLaren-like tweaks if they are to return to competitiveness this season. The Williams was disappointing after Rosberg's optimistic comments yesterday, Nakajima finishing in 13th and ahead of his team leader. It seems to be the team's fate in recent seasons to be variable from one track to the next and the FW31 is no exception it seems. It must have been the rain that ruined Toyota's chances after Trulli had shown so well in practice. Fourteenth was much lower than he had expected, although Glock had an even worse time and failed to make it beyond Q1. And the Toro Rosso boys still found it impossible to make their cars behave like Red Bulls. Bourdais takes the blame, of course, and rumor has him soon to be replaced by Jaime Alguersuari . We shall see. Ari Vatanen for FIA President! It looks like McLaren and Renault have actually found a sweet spot? Sadly, though, no one seems to be interested in taking a solid picture of Hamilton's new diffuser. James Allen believes that in McLaren's case it will only work here at the Nurburgring. There is an interesting race going on within. It would seem as though McLaren are beating Ferrari in the race back to the front. John Cleese for FIA president. Hats off to Sutil - all the more so as he is fuelled heavier than anyone else in Q3! Hmm, tomorrow shall be interesting. Michael: I think that's a bit pessimistic of James Allen - the MP4-24 has been quick on other tracks before its recent bad showing and it may be past the worst now. After all the work the team has put into it, the car really ought to be showing some improvement anyway. Nick: Ferrari do not help themselves with their disorganisation, once again shown in qualifying with the wrong tyres for Massa. I think McLaren's improvement is genuine and will continue at other circuits. And John Cleese could do no worse than the current comedian masquerading as boss of the FIA! Patrick: Agreed - an excellent job done by Sutil. He is heaviest in the top ten and still managed seventh spot. Webber, too, is looking good on the same fuel load as Vettel and considerably heavier than the Brawns. Really hope Sutil does well, first points for the team would be very welcome. However, being surrounded by 4 KERS cars and heavy at the beginning is maybe not ideal. I do have to admit a little disappointment that Hamilton didn't attempt another go at pole. Guess he ran out of suitable tyres. Still, I have a suspicion that weather may ultimately have more say in tomorrows race than the grid does, on all counts. Well done for Webber. I hope it rains myself but we shall see. Is this McLaren's turn around? Stay tuned. Good to see you back Clive. What a great qualifying session. Augurs well for a good race if Barrichello can keep away from Webber at the first corner! I thought Ferrari had taken their KERS units off? If so, Adrian might be in more trouble than I thought. Sutil did a marvellous job, timing his laps just right for the weather conditions and maximimising a car that, whatever its other faults, can heat its tyres up well. I would love to see him score a hatful of points in this race.